low and curvy nose, and too masculine facial line gave me stress. So I started visiting plastic surgery clinics. 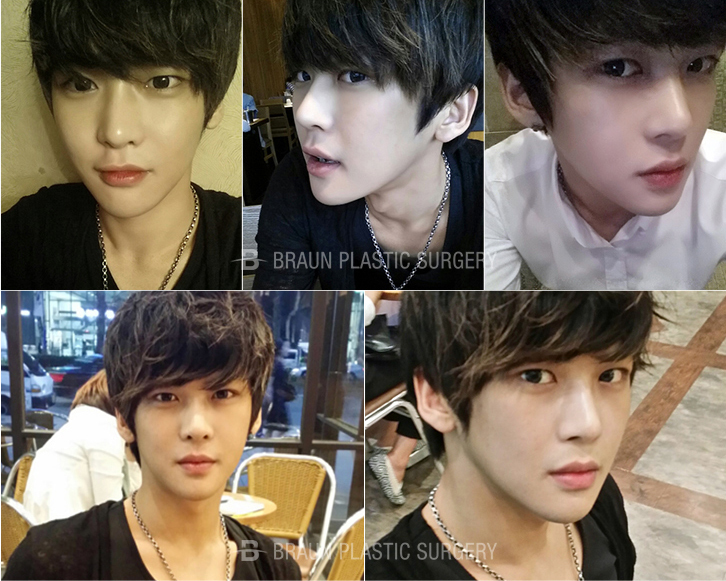 Finally, I got to know Braun Plastic Surgery Clinic!!! had nose and facial contouring from Braun. and are famous for creating beautiful nose lines. So that made me trust Braun and I decided to get my surgery there. He had deep dark circles that made him look sick and a low and aquiline nose with a round nose tip. Also, his protruding cheek bones, square and long jaw made him look depressed. 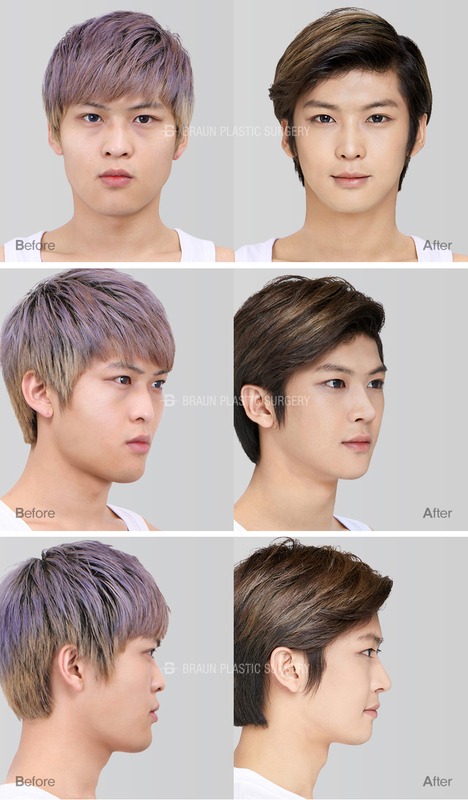 99% handsome, filling in the 1% and reborn like an idol star! After surgery, I hear that I am handsome every day. My friend told me I am perfect now, not slightly less than handsome anymore. but I’ve never heard that my surgery is unnatural. It doesn’t look artificial and looks so natural!! I think it’s because my facial strengths stand out and the weakness were supplemented. The doctor’s skills are the most important thing for fixing shortcoming in the face !! Before the surgery, I talked to my doctor and took pictures. Then I changed to my patient’s uniform and went in the operating room. I didn’t need to be and talked to me so I could relax. I heard the anesthesiologist say he was going to start and I fell asleep. I was thirsty, so I was looking for water. so they didn’t give me water. They said I can drink water after 30 minutes but that 30 minutes felt like 3 hours. However, if there was no nurse talking care of me, it would have been worse. Men feel the pain as well after the surgery. cotton balls and gauze on the first day after surgery. It was terribly swollen. I don’t want to see that face again. Fortunately, painkillers and injections helped my first day so I could fall asleep without pain. Braun’s postoperative care is great. They take care of the patients with the greatest care. On the 5th day, the cotton balls in my nose were removed. I was so happy to breathe through my nose. After that, moving my mouth was easier and eating was much more comfortable. I could see the swelling getting better and I was so happy. but the treatment from the clinic played a big role. The people who gave me treatment said my swelling was getting better faster than others. They said my face was changing every time. Whenever I get praised, I think my surgery was a good choice. It was all about swelling until 2 weeks. I tried real hard to make my swelling better. My doctor and nurses were surprised how fast my swelling was gone at the follow up check. and I took a walk often to move around constantly. Finally I can see my slim facial line! After a month, I could see my face had totally changed. My biggest stress was my nose when I took a picture before the surgery. My nose was hooked and the tip of my nose was downturned and curved. my face looked unbalanced. But after the surgery, my face is balanced at every angle! Nowadays, I am a cute and soft man rather than tough guy. When I have a blank face, I hear that I look charismatic. and I am excited to see how my face will be changed after all the swelling is gone. My face is really natural. nd I have no problem moving my mouth and doing everyday life activities. I went to the clinic and had a check up with a 3D CT.
but my doctor said the 3D CT showed all the surgery went great without problems!! It was the moment that made me think that the surgery from Braun was a great choice. Before the surgery, I did shopping mall and other model work. I enjoy shooting even more because I am confident with my face now. Thank you to all the doctors in Braun that have helped me have a more fun and exciting life!! !.